Scott Bruce Rolen made his major league debut for the Philadelphia Phillies on August 1, 1996. Rolen hit 150 home runs for his former team during seven seasons. Like Babe Ruth did with the Yankees against Boston, Rolen hit his 300th home run of his career against the team that gave him his first gig in the major leagues. During the fourth inning of Monday's game against the Phillies at Great American Ballpark, Scott Rolen belted a Kyle Kendrick pitch to left field. As the baseball bounced off the foul pole and back onto the grass, Rolen rounded the bases for the 17th time this season and the 300th time of his career. Rolen's two-run shot broke open the scoreless game and led the Reds to a 7-3 victory over the Phillies. "Everybody was pulling for him." Dusty Baker said. "Everybody was saying 'hit the foul pole, hit the foul pole!' because it looked like that ball was going to go foul. That's a tremendous feat for a player and man. So we're all very happy for Scotty." At 35 years of age, Rolen is on his way to have his best season since 2004 in St. Louis (34 homeruns, 32 doubles, 124 RBI, .314 average) when he led the Cardinals to a 105-win season. Rolen currently leads the Reds in home runs (17), is second in RBI (53), and third in doubles (17) and average (.301). Rolen has accomplished all this while playing in less games (70) than any other everyday player. Like Ken Griffey Junior's 500th career home run on Father's Day 2004, Scott Rolen's 300th was also on a special occasion. Rolen's entire family was in town to celebrate his parent's 45th wedding anniversary. "We didn't talk about it at dinner," Rolen said. "My parents had their 45th wedding anniversary. That's the most important thing. That achievement is bigger than this one, so let's leave that one to itself. I was able to do it tonight." Rolen's 300th home run was also the fastest trot of the day according to Wezen-Ball.com's Tater Trot Tracker. At 18.29 seconds, Rolen took little time to enjoy his modest milestone as he rarely does. Six of his seventeen homeruns this season have been the speediest trot of the day. 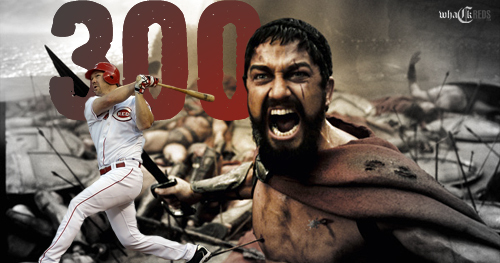 Rolen's 300 career jacks tie him with hall-of-famer Chuck Klein for 127th on the all-time career home run list. Honorable names Rolen has surpassed on the list include Rickey Henderson (297), Craig Biggio (291), Will Clark (284), Eric Davis (282), Paul O'Neill (281), Ted Kluszewski (279), and Roger Maris (275) among many others. Scott Rolen has undeniably been a massive factor in the Reds' league leading defense and offense this season. His experience and leadership has lifted the Cincinnati Reds to the top of their division. Whether it's his seven Gold Gloves (3rd all-time for third basemen), or his 300 career homeruns, Scott Rolen and the Cincinnati Reds are a force to be reckoned with in the National League. Aaron Harang (6-7, 5.07) will face Roy Halladay (6-7, 2.29) and the Phillies at 12:35 on Wednesday. The series is tied at one game a piece.